Being a nurse blogger is such an amazing thing! I really love what I do so much. But some days it is more challenging than you may think. So let’s take a look behind the curtain. When you start to add up all the time it takes to create relevant content, make it look nice, and post it everywhere so people can find it! A special shout out to all of you nurse bloggers out there. It’s not easy working as a nurse and trying to run a successful and helpful nurse blog. It takes a ton of time, financial investment, and constantly being plugged into the ever-evolving online world of blogs and social media marketing. It’s also tough having a foot into the world of business, because learning how to be a successful nurse is nothing like being successful in business. I’ve been burned before by trying to help out companies who were just trying to get the most out of me for the least amount of money, who lied and manipulated… and I didn’t realize it until it was too late. I was just trying to be that helpful nurse and person to them, when I was just being used. You work for hours and hours, trying to create helpful and relevant content for your fellow nurses, and sometimes it can get pretty tough putting yourself out there… getting people who are mean/rude, who think you need to be all things, trying not to offend but speak about important topics, being true to yourself, and spending money in certain areas only for some people to complain, and others to steal. But, there’s also so much to gain from putting yourself out there, putting in the time, and creating something really great. I personally am not scared of nurse blogger competition – the more the merrier. The better our nurse blogger world is, the more our profession is elevated. Whether it be from just encouragement and support, to practical clinical help, to creating resources, to connecting with nurses all over the world who are engaged in the latest evidence-based practice at their facility. 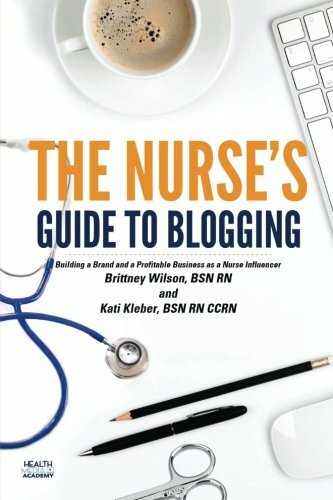 Brittney Wilson BSN RN (AAK The Nerdy Nurse) and I are creating a seminar about how to practically start a nursing blog, avoiding some of the mistakes we made, and some important things we’ve learned along the way. Stay tuned for more info on when this will be! And if you won’t be able to attend in person, no worries – we’re working on creating online learning modules to compliment this as well. Sign up now to get a great checklist you will need to create your nurse blog! Great post! Thanks for putting it together and sharing the range of emotions we all experience! This is great! Thanks for blogging how we all feel. I love the animations- showing exact emotions. I was laughing throughout. Looking forward to reading more from you. PS sorry for the competion. I didn’t even know about that and all the other things you have to go through. Thanks to you for keeping it up! Great post! Thanks, Kati, I was laughing throughout.